” Excuse me miss, would you like to dance?” It means a lot to me when a beautiful girl accepts to dance with me a slow song. It’s also hard nowadays to find a really good DJ, because every DJ that my school, or a party that I go to, gets only plays Dub-step! It’s starting to get annoying, no offense to those who like it. Maybe later on I can upload a recording of my amateur DJ skills with songs that you can actually dance to; I know, shocker, music you can dance to. Yes, I do DJ a little bit when I have time aside from my busy schedule called my life. As I was saying, a slow dance with a girl is one of those things that you can’t buy, you have to earn it. Whether it be with your girlfriend, a date, or even just a friend. You earn it by asking her to dance with you, it would be your pleasure to invite her to dance to a very special song you have been saving for her only. In doing so I believe that it would make her feel exceptional, as men that’s what we intend to make our lady feel like. Prom is just right around the corner, so it’s time o start asking friends or girlfriends to the most important dance of the year. I was already ready to go since three months ago, because I asked a friend to prom at another party during a slow dance. I thought it was romantic, except for the part of not having flowers to give her. I don’t know why but, if I want to ask a girl to a big dance I feel that it’s crucial to have flowers, or else there is a higher chance they will say no, for lack of a sign of “affection” toward them. I want my girl to feel that I went out of my way to do something very unique just for her. This entry was posted in School life. Have you ever felt like no matter where you are your invisible to everyone else; so alone. Now that I think about it, right now I’m reading a book called Invisible Man by Ralph Ellison. What I don’t understand is why do we have those lonely days, where we feel as though no one wants us; sometimes they can last longer than just one day–at least for me they do. I don’t know if you’ve noticed but whatever I’m feeling one day, I attribute that emotion to a genre of music. People have asked me, “What’s your favorite type of music to listen to?” I replied–and will always reply–that it depends on my mood of a certain day that attributes to what I feel like listening to. I’ve had days where I’m so overpowered by a genre of music that I will immediately start to look around for instruments that I can play on to imagine myself being really good at them; to appease my emotional cravings. It’s those moments where I know what music really is and what it does to a person who lets them self be the music. When I listen to music I am never alone because it tells me that there is someone else who feels the same way as I do. Even then, I still wish that I could share my love and appreciation for music with a friend that I can count on. I do feel alone most of the time. At school there isn’t anyone who goes to look for me to spend time with me. I see others that have best friends that never leave their side; together no matter what. When I was in middle school I had a best friend, Max Underwood, and he was the one person that ever treated me like a true friend. When we became freshman in high school we lost communication, breaking our touch. However, I welcome loneliness, without it I wouldn’t be able to practice my trumpet with concentration or study for AP Classes. With these professional goals on my mind consuming all my time, they distract me from my physical solitude. This song is another one of a collection of Jazz songs by the great Michael Bublé that speaks from the heart. This entry was posted in The Awakening. This is a must see video! Caravan Palace surely knows how to get the party on its feet. These guys are talented and amazing because their inspiration is from the 1920’s but have the back beats of today’s music to create a perfect combination of rhythms and melodies. Music to inspire dance moves isn’t hard to find these days. However, a retro sound that inspires the Charleston, the Breakaway or if you’re particularly fast-footed the Lindy Hop, is not a common occurance. French artist, Caravan Palace does just that utilizing clarinet, double bass, electronics, trombone, vibraphone, percussion, guitar and violins with enough energy to get you riled up in a frenzy of toe-tapping tantrums. This Electro-swing sound combines old 20s inspired jazz and swing beats with a modern electronic twist that at times even gives off a trip hop vibe. “El Mariachi”, that’s my nickname. I don’t know if you guys have ever seen the movie Desperado, or Once Upon a Time in México before, but the protagonist, Antonio Banderas, “El Mariachi”, is a guitar player trying to start his life again as a mariachi. Other people only call me by that name in my Spanish class though; I wish they called me that outside of the classroom. No, instead they call me E-man in the outside world. Since my participation in high school is coming to an end, I only hope I can leave with other students knowing who I really am, a dedicated, hard working, ambitious student, a trumpet player, and a loyal and trustworthy friend. If I was to describe myself in one word it would have to be ambitious. Why ambitious? I have noticed that although I don’t manage my time wisely all the time, I still get my work done, and I do have grand plans for myself that I hope to fulfill in my future. Still, there is a saying that says, “If you don’t do what you want today, you will wake up one morning and find that there isn’t any time left to do what you wanted”, something like that. These times that are passing by me too quickly are scary. I haven’t exactly decided on a major yet between Aerospace Engineer and Trumpet performance, which is stressing me out so much. That’s why I need this Spring Break badly to get all the things going on in my mind straightened out and to maybe get a little time to just relax for a change. 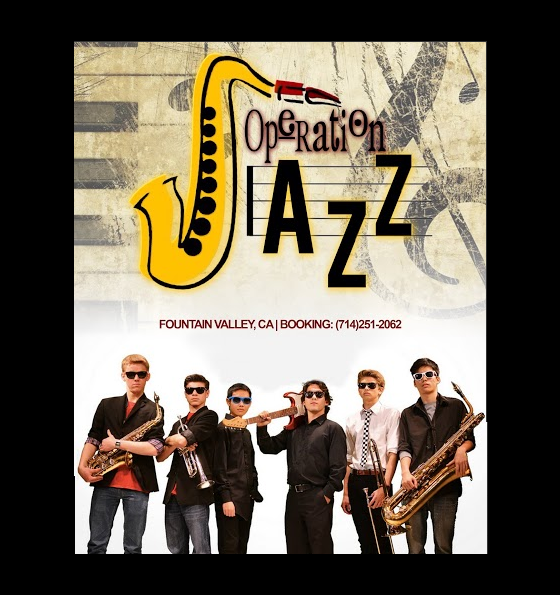 Thanks to my good friend Beverly, an ASB media tech., she helped me create a flier for my Jazz group, Operation Jazz; and if I may add, she did an amazing job. The logo design was my own creation which Beverly brought to life with the vibrant colors and word font. We both agreed that it would be a great idea to include either a full group picture of the band or a group of individual pictures of the members at the bottom of the flier. The group is currently in practicing a new song titled Chicago by Buddy Rich. It’s a hard piece, but what’s music without a challenge. After all my old trumpet teacher once told me, “If playing an instrument was easy, everyone would do it”. Plus people don’t enjoy the easy stuff as much as the harder things that others do in life because they aren’t afraid of the challenge or risks they encounter, the only person holding someone back from fulfilling their dream is them self. Let me go back in time for a minute to tell you the origin of Operation Jazz. “It was a bright cold day in April…”, (quote from 1984) no I’m kidding. The idea of forming a Jazz band occurred to me back in October of 2013 when my English class was assigned an innovation project that would benefit the community. The was no average volunteer, pick up trash, recycle kind of project. This was something else. My teacher, Mr. Theriault, showed us examples of how to be creative with this “Idea Farming” project; that is the name of our class step by step process that we made as we went along with out grand projects. When I began thinking about what I wanted to do, I knew it had to be music based; music is my life. When I first pitched the idea to my classmates about playing music for the public, jazz specifically, they doubted that I could pull it off and find people who would be willing to join in on my project. Hearing their comments made me want to kill the idea altogether, but I knew in my mind that I had to “stick to my guns”. After a day or two I had time to plan out what I imagined going forward with my idea would be like. I took into account the instrumentalists I would need, spreading the word through social networking, and gigs and practices. The group that would consist of the best musicians I knew from school that would unite to form the exclusive group. This entry was posted in Jazz. Yesterday was the big day! Festival time. The moment of truth the entire Wind Ensemble had been looking forward to this concert season. When it’s concert time, you know what that means, it’s time to suit up, or tuxedo up for the guys. The festival we played at was at Beckman high school in Irvine. When I arrived I thought that it was a private school because of how clean, proper, and respected the school and students were. The FVHS Wind Ensemble performed two pieces: Shenandoa by Frank Ticheli, and Jubilance by …. So in our Ensemble we have 5 trumpets, including myself. However, two of the players are on the baseball team at my school, and they happen to have a game on the same day at the same time. So instead of having 5 trumpets at festival we had 3. This was a good thing and a bad thing for me. The good part was I now played the solos in the pieces. The bad part was that since we had less trumpets it’s easier for anyone to catch when anyone one of us messed up. In the end we all played our pieces very well; I hope the judges give us a high Excellent award for our performance. The piece that I have below in the video is called Donzón No. 2 by Arturo Marquez. This is one of my favorite pieces ever because of the Latin salsa feel it has to it. Trust me, you will like it. It starts off with a love song then it turns into a dance speeding up and slowing down. Just today I was thinking about the day we went into the gym, at school, to discuss possible careers we would like to study. The way the host came about possible options for us was, she asked what our interests are, put them together and that would be it. For me my passions are music and engineering. Mix them together and I came up with a studio recording engineer. After I put that puzzle together I realized that it’s not a bad career option. I can imagine myself sitting in a studio recording room working the sound board for a famous pop group or singer. Truth be told, it is also a dream/goal of mine to be the person behind the microphone playing my trumpet. This entry was posted in Uncategorized and tagged recording.